Dogpound In San Pedro - Another visit to the dog pound out near San Pedro and another experience. Baja Dogs La Paz Refugio and the dogpound are run very differently; both are needed in La Paz. BD Refugio rehomes dogs once they are healthy. The dogpound is there to help reduce the dog population. We visited the dogpound today which is run by the government - it is very clean and the student training rooms are immaculate; the workers are great. They put dogs down on Tues and Thursdays. The time for a possible adoption or return to owner is 3 days. Saturday they were going to put down all the dogs including 2 very cute black pups approx 8 months old. Wanting to help and having room we ädopted 3 of the dogs. We were also told that the pound had cases of parvo and distemper within the last month. As all the dogs are kept in close proximity and not vaccinated we were careful. We tested all 3 dogs; the 2 black pups were positive for distemper and put down. Daylight Saving Time Ends in Mexico Set your clocks back one hour. Mario's Bar At The Hotelito - More tables, more lighting!! 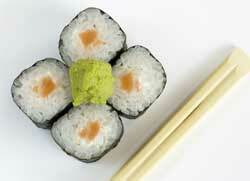 We are back and Porfirio/Chopin has added some wonderful new Sushi Rolls to his menu; Rainbow Roll, Mazago and Unagi. There is also a delicious Sashimi Salad, served with organic greens.We are also serving Chicken or Beef Satay on all three nights, cooked on the BBQ, served with Jasmine rice and salad and a spicy peanut dipping sauce. Every Friday and Saturday we will be serving Indian curry. This weeks menu: Kerala coconut shrimp curry,Aloo sag ( spinach and potatoe curry,) Dahl, spiced yellow lentils, and Basmati rice. Raita, mango chutney and pickle accompany the curry dish. We have a new wine list and, as ever, Mario's delicious cocktails. Open from 6pm until 10.30. Thursday Friday Saturday. Spanish Lessons - Study Spanish with Guillermo Bueron. Berlitz Total Immersion Method for all levels. The Survival Spanish Program will teach you the basic words and phrases used during travel to Spanish speaking countries. The Intensive Program. 20 monthly lessons. Learn to integrate the minor and major grammar tenses. The Mexican History Course for Citizenship. Tai Chi And Qi Gong Classes - Instructor, Rhoda Jacobs, over 35 years of experience with the T’ai Chi Foundation, www.taichifoundation.org. Beginning T’ai Chi Class - T’ai Chi, Yang Style Short Form, for health, regeneration, rejuvenation, and relaxation of the body, mind and spirit. Try the first class for Free before signing up for the course. Thursdays 4:30-5:45 PM, at La Arca, beginning November 11th for12 weeks. One can join this class up until December 9th after which enrollment will be closed for this series. Students who wish to repeat can join in at any time. Tuition: $1300 pesos for the 12 week course if paid at registration; $130 pesos per class if paid in installments. Repeats half price. 5 Element Healing QI Gong Classes - You will learn different postures and movements that activate the movement of chi along meridians to specific organs in your body - awakening and sending energy to areas of your body that need attention. Series of 5 classes, Tuesdays, 4:30-5:45 PM, at La Arca, November 9th- December 7th. Students can sign up for all 5 classes or join any class. Tuition: $ 600 pesos for the series; or $130 pesos per class. Airport Parking/storage - San Jose Storage is conveniently located next to the San Jose del Cabo International airport. We offer daily and monthly parking with outside, covered, or garages available with airport transportation and car wash / vehicle maintenance while you are gone. San Jose Storage also offers mini storage units from 5x5 to 10x40. 1.4 miles From the Center of Town and 15 mins. Walk to the Ocean. 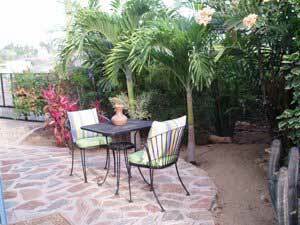 Large Flat-screen TV with DISH including HBO and WiFi Internet Access. Ricardo Amigo Real Estate - We conduct business at a very personal level and can help you with each step of buying or selling property in Todos Santos, El Pescadero and surrounding areas. In our office you will find experts in real estate sales and market valuation, creation of Mexican corporations and fideicomisos, subdividing and titling, title insurance and escrow, and a host of additional resources to help you. In short, we will help make your search for or sale of a property as simple as possible. Farmer's Market At La Esquina 9a.m. to 12.p.m. Nov. 11 - ARTS Artists of Todos Santos opening of the Mexico Celebrates 1810, 1910 and 2010 Show, celebrating the Anniversary of the Revolution & Independence of Mexico. Reception from 5:30 to 8:30 pm at Visions Gallery, located at Cafelix Coffee & Kitchen. Diane Knight, dianekknight [ -at- ] hotmail.com, www.artistsoftodossantos.com, Todos Santos. Dec. 16 - ARTS "Meet the Artist" talk at Cafelix. Speaker TBA. Mar. 24 - 11th Annual Baja Shakespeare At Rancho Buena Vista Hotel. Running the 25th, 26th & Sunday March 27th, 2011. Auditions will be in late Dec. 2010, no date yet. Nov. 27 - Dancing Under the Stars at Hotelito, 7:00 PM. This event is a fundraiser for the Todos Santos Youth in Video project which is sponsored by Festival de Cine de Todos Santos. 145-0099, Todos Santos. Apr. 9, 2011 - Home and Garden Tour hosted by Escuela Pacifica. Mexican Cultural Presentation - Every Tuesday at 1:15 pm in easy Spanish. Free. Walk-ins welcome. Se Habla La Paz Spanish Language School Fco. I. Madero #540 La Paz (between Republica y Guerrero) - Juli Goff, info [ -at- ] sehablalapaz.com, www.sehablalapaz.com.